Reg $295. 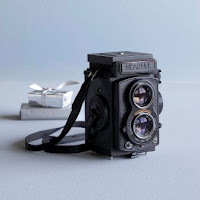 Brand new camera with serious vintage style, and what's more, with these cameras, you can aim and shoot from the hip. From Sundance Catalog. Ooh, I am so spending some of my leftover Christmas $$$ on one of these. I know, very tempting, right? If you do buy one, please review it and let me know -- I want to know how it performs!